Most people have heard of fish oil supplements, which can help support heart and brain health and functions, and even lower blood pressure and cholesterol, but what exactly is Krill oil, and what is it used for? Contains 1000 mg of krill oil PER GELCAP. Highest naturally occurring EPA, DHA, Phospholipids and Astaxanthin. Made with Superba2 Krill Oil. Less Krill smell with No Aftertaste. Certified by the Marine Stewardship Council. One of the most popular and effective brands of krill oil is Antarctic krill oil. Antarctic krill oil gives users more Omega-3s for their dollar. This product contains over 1000 mg of krill oil per capsule, and it also contains active ingredients, EPA and DHA. Additionally, Antarctic krill oil products contain a new formula, which have proven to increase Omega-3 and fatty acid levels in the body. So what exactly does krill oil do for the body, and how is it different from fish oil? Read on to learn some of the major benefits of krill oil as well as some key differences between krill oil and fish oil. How Much Krill Oil is Recommended? Are There Any Side Effects from Krill Oil? 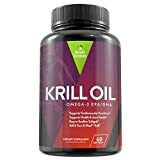 What is the Best Krill Oil Brand? Do you want to renew your health, and live a happier and more fulfilling life where you just feel great every day? Who doesn’t?! But living a happier and healthier life doesn’t always mean you have to take up body building or quit your job. Sometimes simply making better diet choices and even taking dietary supplements can give your body what it needs and what it has been lacking to feel better about, well, you! Krill oil is one of those supplements that has proven to not only boost your overall health, but allow you to feel better overall. Support Heart Health – According to the Journal of the American College of Nutrition, krill oil can significantly help promote cardiovascular health by maintaining healthy inflammatory pathways. The conditions and functions of these pathways are measured by C-reactive protein (CRP) levels in the blood. Basically, the lower the CRP levels, the healthier the heart. A study on the effects of krill oil determined that the krill oil study group reduced CRP levels by approximately 19 percent compared to the placebo group’s CRP levels. Support Brain Health –We all know that as we age, our memory, sharpness, and alertness begins to decline. However, scientific studies have proven that krill oil can support brain health, and even boost concentration, learning, and memory functions. In fact, a study of a group of 30 adults who experienced attention difficulties showed an increase in concentration and focus levels after taking krill oil capsules on a regular basis for approximately 90 days. Maintain Healthy Cholesterol and Blood Sugar Levels – By taking krill oil capsules daily, users can help to sustain good cholesterol levels as well as reduce bad cholesterol levels. In fact, even individuals who suffer from hyperlipidemia have seen an improvement in cholesterol levels. Interestingly enough, this study concluded that krill oil was more effective in reducing cholesterol levels than fish oil. Visit this site here for more in-depth research on the effects of krill oil. PMS Distress – For women who suffer with severe and uncomfortable pre-menstrual cramps, fluid retention, and mood swings and other symptoms, krill oil might become your “miracle drug”. Krill oil has proven to help reduce and decrease discomfort and pain from cramps, uncomfortable fluid retention, and even frustrating mood swings. How does this work exactly? The blend of Gamma-linolenic acid (GLA), Omega-3s, and antioxidants are the driving forces behind controlling uncomfortable and painful PMS symptoms. In fact, the GLA component is one of the most popular active ingredients that help women cope with PMS. Watch this video by Dr. Mercola here to learn more about the benefits of krill oil for women. Boost Immunity and Immune System Functions – Data also shows that krill oil can support immune system health for athletes. A study performed by Aker Biomarine AS discovered that krill oil increases the production of NK cells, which activate during the recovery process after a workout. When these cells are activated, they quickly react to bacteria and viruses, keeping them under control until the body’s immune system responds. Support Healthy Liver Functions – Because krill oil is a great source of Omega-3 fatty acids, this can help to reduce fat in the liver by up to 60 percent. Fish oil only reduces fat in the liver by approximately 38 percent, making krill oil the better option for a healthy liver. Maintain a Healthy Complexion – If you suffer from blemishes, break outs, and even dry skin, krill oil might be just want you need to finally have the healthy complexion you’ve always wanted. Because krill oil contains a number of antioxidants, these antioxidants have been known to defend skin cells against damage, giving you a beautiful, brighter, and more youthful complexion. Not only can krill oil help you to fight against acne, it can also help lower your risk of inflammatory skin disorders. This is because the Omega-3 fatty acids work as anti-inflammatory agents, decreasing your risk of a disorder, such as dermatitis. Check out this article on the effects of krill oil on the skin. Improve Joint Function – If you suffer from a form of arthritis, whether it is as serious as Rheumatoid Arthritis (RA) or arthritic pain flare-ups, krill oil can help improve joint function, reducing the onslaught of arthritis. One study in the American Journal of Nutrition discovered that krill oil helped lubricate joints and reducing inflammation. As a result, participants experienced less joint pain and discomfort, less stiffness, and an increase in overall mobility. These results were noticed within the first seven to 14 days of taking krill oil capsules. Neuropathy – Neuropathy is a condition that causes nerves to malfunction and make you experience pain and severe discomfort, crippling your life, and making you miserable. Krill oil, fish oil, flaxseed oil, etc that contain Omega 3 are building blocks of nerve tissue and are extremely beneficial at higher doses (about 6 grams per day). This leads to a reduction in nerve inflammation. Ask for neuropathy supplements the next time you visit your doctor. Omega-3s and Omega-6s are very important for human health. We typically get Omega-3s and Omega-6s from vegetable oils, fish, walnuts and tofu, for example. However, it’s also true that humans don’t necessarily get the recommended amount of Omega-3s on a regular basis. This is why many adults who are are trying to lower cholesterol, blood pressure, lose weight and even help improve their skin complexion will take a oil supplement in order to give the body the necessary amount of Omega-3s. But what is the recommended dosage? According to the Mayo Clinic, adults typically only consume approximately 1.6 grams of Omega-3 fatty acids daily. Most organizations and health care professionals will recommend at least 500 mg of Omega-3s and EPA/DHA per day. However, dosages may also vary depending on the individual’s health needs. For example, a pregnant woman who is lactating should consume at least 250 mg per day, and adults who want to promote cardiovascular health should consume the recommended dosage of 500 mg per day. According to the American Heart Association, it is recommended that adults consume at least two fatty fish meals per week. Such meals can include, salmon, halibut, and tuna. Visit Mayo Clinic here to learn more. Although you may find numerous articles on the Internet claiming that taking krill oil is dangerous, most of them are simply written based on opinion or for marketing purposes. However, when reviewing scientific research and the facts, krill oil dangers, including side effects are extremely low. In fact, as we’ve already explored above, the top active ingredients in krill oil, such as Omega-3 fatty acids, EPA, and DHA are essential to support and promote overall health. Furthermore, these active agents also serve as antioxidants, which are also important for human health, and have been consumed by humans for centuries. It’s important to keep in mind that because krill oil is a dietary supplement, and each indivudal person is different and has unique DNA, each person responds to dietary supplements differently. If a user is new to taking supplements, then some side effects may be common in the beginning. This is simply the body adjusting to new ingredients. Although rare, if users begin to experience more serious side effects, such as a fever, rash or if any of the above side effects persistent, then it is important to consult with a medical professional as soon as possible. Read this article here to learn more about the possible side effects of taking krill oil. Now that we have explored krill oil in detail, you have likely noticed that krill oil has many of the same active ingredients, such as Omega-3 fatty acids, EPA, and DHA as fish oil, and even provides some of the same benefits to humans. So you may be wondering what the difference is between krill oil and fish oil? Does one work better than the other? In reviewing the benefits of krill oil, we’ve already seen some eamples of how krill oil has been more effective than fish oil in some areas. For example, we’ve seen that krill oil is more effective in maintaining cholesterol and blood sugar levels, supporting a healthy liver and liver functions, and it also provides more benefits to women. Many women have claimed that krill oil has aided them in pregnancy, breast feeding, and even relieve symptoms of PMS. Furthermore, several laboratory tests have concluded that krill oil is less damaged than fish oil. This basically means that after krill oil is exposed to oxygen, it is less oxidized than fish oil. Fish oil results in some damage after being exposed to oxygen after only one hour. This means that krill oil is nearly 200 times more resistant than fish oil. Read this study here to learn more about the differences between krill oil and fish oil. Now that you have learned a lot more about the benefits, effects, and differences of krill oil when compared to fish oil, which oil supplement is best for you? We’ve already took a look at our number one pick for krill oil, Antarctic krill oil, but let’s look at two other krill oil supplements that are also worth trying. Viva Labs Krill Oil features the highest potency. The omega-3’s in Euphausia superba (krill) are bound to the identical structure of human cell walls. Each batch of Viva Labs Krill Oil is third-party tested. Certified under the International Krill Oil Standards Program. Clinically proven to support cardiovascular, brain, joint and feminine health. Viva Labs krill oil is one of the best krill oil brands because it contains a higher level of Omega-3s compared to other brands in the industry. This brand provides 1250 mg of Omega-3s and contains a high potency of EPA and DHA per serving! Viva Labs also uses a unique Caplique technology, which helps preserve the freshness of krill oil. These capsules are also unique in that they are not enteric coated or filled with other unnecessary ingredients, which have been known to hinder the beneficial and natural nutrients in krill oil. 100% advanced K-REAL Krill Oil free from impurities. Advanced multi stage oil extraction process to significantly reduce the fishy taste. Multi stage oil extraction helps eliminate Trimethylamine. A highly purified fish oil supplement. Manufactured in the USA with premium quality. A good runner-up to the Antarctic krill oil we reviewed already, this version of krill oil by Naturo Sciences is another highly effective krill oil supplement. One of Naturo Sciences’ top benefits of this brand is that it does not cause a fishy aftertaste or gas or bloating, which is a common side efffect from taking krill oil supplements. Additionally, Naturo Sciences krill oil does not contain any impurities or any other additives. Each serving of Naturo Sciences krill oil provides users with 1000 mg of K-REAL krill oil, putting this brand at the top of the list for the most effective krill oil supplements that provide users with desired effects, health benefits, and all without the fishy aftertaste. In conclusion, because of the large amount of Omega-3 fatty acids, krill oil supplements are essential for overall human health. Numerous scientific studies have proven that Omega-3s are necessary for optimal health, and most adults don’t consume nearly enough Omega-3s as recommended. As a result, medical professionals and health care providers are recommending krill oil supplements for users who are looking to help lower and/ or maintain cholesterol levels and blood sugar levels, to maintain healthy liver functions, and even support female health. Even if this is the first you are learning of krill oil and its benefits, you can clearly see the similarities and differences between krill oil and fish oil. If you are trying to decide whether you would benefit more from krill oil or fish oil, the decision really depends on your health needs and goals. The choice is yours.